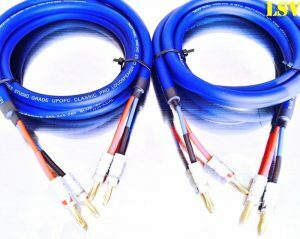 New Chord Shawline Audio Speaker Cables 2 x 1.5m (A Pair) Terminated. The cables are high double pressure crimped of professional crimping tool AIRLOC HIGH PERFORMANCE TERMINATION (for maximum contact surface area)To a Very high quality 24 gold-plated AIRLOC spring-loaded plugs on both ends.. The ends finished with branded colour coded black and red (marked arrows) directional heat shrink sleeves. Additionally all strip of conductors ends they are coated with extra RED & BlACK High Density Matte Solid Expandable Braided Cable Sleeving.It is the Tight, High Quality, High Density, Matte, Solid Sleeving Which protects and hides wires while Increasing air flow. Arcam – Linn – Cyrus and all other good quality audio products),or spade connrctors. • The Chord other Bi-Wire Link (Speaker Jumper Cables). • The Chord Analogue Interconnects. • The Chord other Speaker Cables. Chord Shawline speaker cable can convey great information extremely well and produce real improvements to the weight, attack and dynamic of bass, likewise mid and treble. Cymbals are noticeably more realistic and acoustic guitars and pianos. If you would like a different combination of spade connectors to banana plugs, or different cable lengths, please ask. Please have a look at our other items, Any questions please contact with me.Thanks for looking. • Chord Shawline speaker cable uses a high density braid and foil combination as part of its design and includes silver plated PTFE insulated conductors. 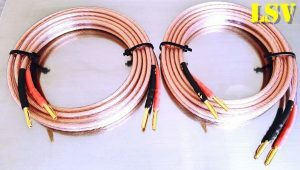 • New shielded speaker cable design featuring silver-plated conductors and high frequency effective shielding. • 16 AWG multi-strand silver-plated conductors with PTFE insulation. • Twisted pair configuration with PVC internal jacket to minimise mechanical noise. • Dual layer high frequency effective combination shielding. • Terminations: 24 karat gold-plated banana plugs, direct gold-plated copper spade connectors.